A recent eye-opening study* has found that the benefits a walk in the countryside can boost your mental wellbeing for up to seven hours. Ahead of National Stress Awareness Day on Wednesday 7th November, HF Holidays has announced its new 2019 Outdoor Escape weekends, allowing people to shake off the hustle and bustle of working life for a relaxing few days exploring the UK’s picturesque destinations. The award-winning holiday provider knows all about the impact of walking on mental health and recently nominated Mind as their charity of the year. 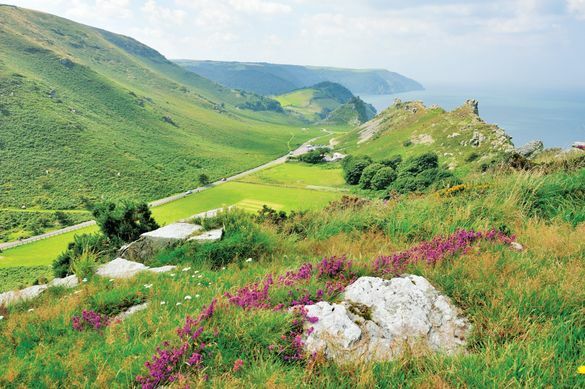 Be as leisurely or adventurous as you choose with a range of three different daily guided walks taking in the very best Exmoor has to offer. Put your legs to the test on a hike to Dunkery Beacon and enjoy views as far as Wales or take in the charm of historic Dunster as you stroll through the cobbled streets on specially tailored walks. Unwind as you explore the tranquil coastal scenery on Britain’s favourite trail, the South West Coast Path before spending evenings enjoying hearty meals from HF Holidays’ charming country house, Holnicote House. Price: 3 nights departing 26th April 2019 from £290pp. Price includes full board accommodation. To book, visit www.hfholidays.co.uk or call 020 8732 1250. The luscious Northumberland scenery is waiting to be discovered on this relaxing walking break. Explore the fantastic ridge walks across the Simonside hills, the pretty market town of Rothbury as well as the beauty of Alnwick Castle, featured in the early Harry Potter films. Stride along the Northumberland Coast Path all the way to the Scottish border and breathe in the refreshing sea air. Stay at HF Holidays’ Nether Grange, a historic 35-bedroom property that surrounds the Alnmouth coastline. Price: 3 nights departing 3rd May 2019 from £325pp. Price includes full board accommodation. To book, visit www.hfholidays.co.uk or call 020 8732 1250. Places are limited on these holidays so book now to avoid disappointment. For more information on HF Holidays, please visit www.hfholidays.co.uk or call 020 8732 1250.